At SENSY, our daily challenge is to adapt the interface of our force transducers to meet the operating constraints in the field. We manufacture force transducers based on strain gauges technology, with a standard output between 5 and 30 mV (power supply: 10 VDC). 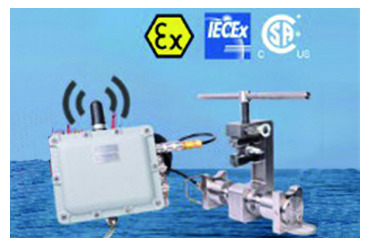 Wireless transmitter/receiver for industrial environments. SENSY recently delivered a complete measurement solution, which included a system for measuring the force of five mooring cables operating in a hazardous area, by utilizing radio transmission. FINDING a solution for a customer’s problem: Our customer needed to control the forces applied on the tankers mooring lines during the discharge of their crude-oil cargo. Realization of an Ex- certified receiver mounted on the outside of the ship’s bridge in an explosion-proof enclosure and connected to a computer installed in the safe area. Display of the tension force of each mooring line in a bar graph so that the data can readily understood. Programmable alert thresholds with an audible alarm and a color changing from green to red depending on the force level. Programmable alert thresholds with an audible alarm.